Whether you are building from scratch or replacing an old sink, choosing a new product that you interact with on a near-daily basis can be an exciting endeavor. If it's your first foray into searching for a sink, it can be overwhelming. There are a wide variety of materials to choose from. There are also quite a few things to consider when delving into the different types of materials that make a sink shine in your particular space. There are a few popular, economical and visually interesting sink types homeowners tend to choose when remodeling a kitchen. One of the most popular materials for sinks is the durable and classic stainless steel. This dependable workhorse looks good in a wide variety of kitchen décor styles. It's inexpensive and versatile. Stainless steel sinks come in gauges. A heavier gauge can withstand heavy use and is more resistant to denting than lesser gauge sinks, but not by much. A true benefit of the heavier gauge sink is that it is less noisy than standard gauge sinks for home use. This works really well if you are a chef who spends a lot of time working at the kitchen sink. Although the name seems to indicate it is without its stain issues, a stainless-steel sink can get scratched up rather easily compared to other types of sinks. Relatively new, composite sinks offer a matte finish and durable sink that is easy to clean and gorgeous to look at. Composite sinks are generally made up of granite or quartz with a resin filler. It contains about 80 percent of the granite or quartz stone to 20 percent resin, although that depends on the product and manufacturer. The end result is that it produces a material that has the look and feel of the real thing without the difficult task of cleaning and maintaining the pure material. 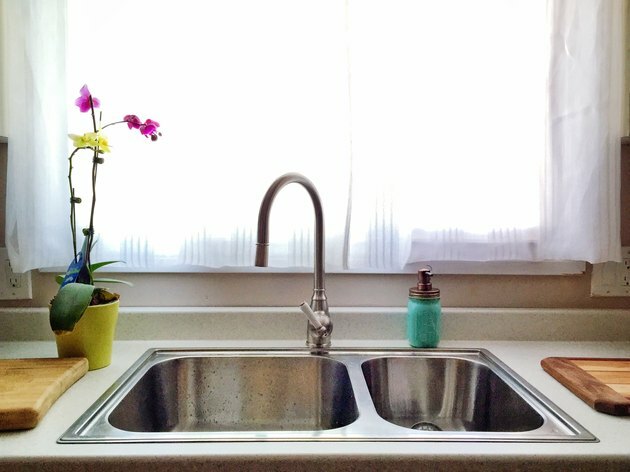 This is a long-lasting sink type that works in almost any kitchen décor. It comes in a wide variety of colors and depths. The bright, glossy enamel finish of cast iron has long been a popular choice among designers and DIYers. Tough and stable, porcelain enamel is surprisingly durable to chipping and can last decades. It's lovely but also heavy, with a typical sink weighing in at more than 100 pounds on average. That is usually more than double the weight of an average sink. For this type of sink material, the cabinets will need to be built to support the sink without buckling under the weight over time.